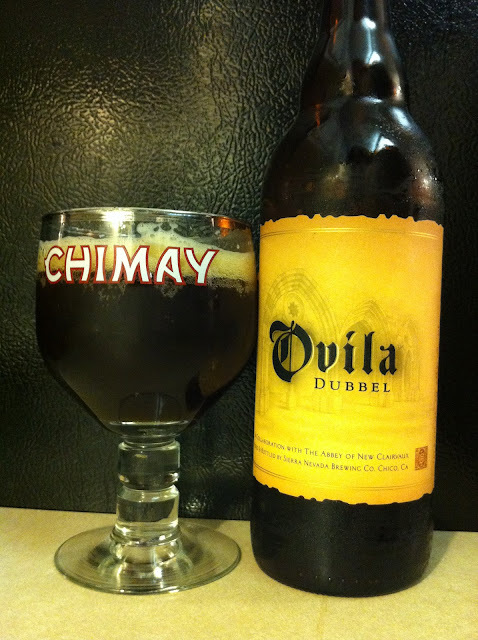 Time for another beer review... this time the Sierra Nevada Ovila Dubbel. I picked up a few of these from Marcello's in BR when it was first released. It's a bit weird to see a brewery like Sierra Nevada (@sierranevada), known for West Coast hoppy beers, to go after a Belgian style. I know it's not their first Belgian-style ale, but it's close to it, and it's the first one I've ever tried. Knowing Sierra Nevada, it's going to be a little more hoppy than a typical dubbel, but there's not necessarily anything wrong with that! Now... on to the beer! It has a nice pop to the cork, and it pours a murky deep orange color with a couple fingers of off-white head. It dissipated pretty quick but left some nice creamy pooling. The smell is a little weird to me. The first thing I noticed is a little malt sweetness then a bit of floral hops. Definitely a little more hoppy than a typical dubbel, as expected. The taste is a lot like the aroma except the malt is more forward than the hops. The alcohol content is noticeable and the floral hops are still there in the background. I think this one will really age well, so I'll be sure to cellar a bottle and re-visit later. Overall I'm impressed. This is a pretty fine effort from Sierra Nevada. I know there are still a few cases of this beer at Calandro's... so it's not too late if you want to grab a few. Try one now, and let the other one sit a few months and see how it ages.